What are cloth training pants like? Cloth training pants are made like underwear but using thicker material and incorporating one or more additional layers of an absorbent material in the "wetting zone" to try to contain potty training accidents. They are not really leakproof, but can hold a little accident that the child recognizes and holds to get to the potty. Cloth training pants are pulled on over the feet, but have no means to remove other than back over the feet in case of a poopy mess. Cloth training pants cannot be used for nighttime diapering. So how do Antsy Pants™ compare to cloth training pants? Antsy Pants™ are diapers first and foremost. They're also great for potty training. So while Antsy Pants™ are training pants, cloth training pants are not diapers. 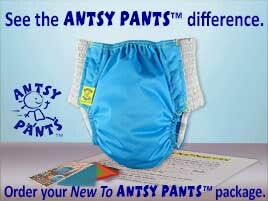 Antsy Pants™ are absorbent and highly leak-resistant. Antsy Pants™ can be stuffed for use in nighttime diapering. Antsy Pants™ have side openings in case of poopy accidents.